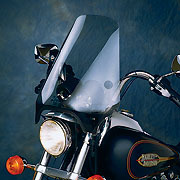 We sell many universal windshields that work on Honda Yamaha Kawasaki and Suzuki motorcycles. Scroll down to see what we offer. These are universal fairings that will fit most bikes with 7 inch round headlights. Modifications to the bike or fairing may have to be made to some models to install. 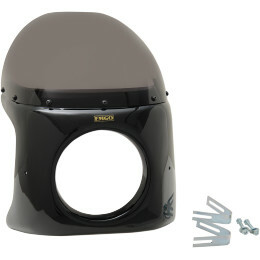 Fairings come painted gloss black and have dark tinted windshields. 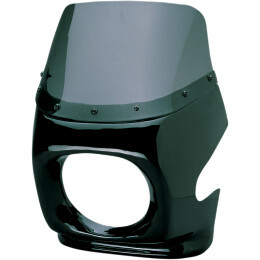 Tinted shield and Hardware included. 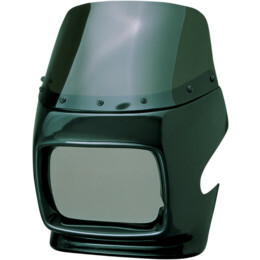 Fairings come molded black and have dark tinted windshields. Classic cafe style! Fits most bikes with 7" headlights. Must be used with very short style cafe or drag bars. Fairings come gloss black and have dark tinted windshields. The mounts hook up to the bolts for the headlight so it is a clean looking mount system. No brackets to mount on the bars. features a solid 4-point mount that attaches to the handlebar area with a "U" clamp and to the upper fork. As a convenience, both 1" and 7/8" clamp sets are included in each hardware kit. Our most popular shield for cruiser type bikes!